We love to hear from our customers and we have literally watched some of them grow up. We've heard stories over the years of how our customers were first introduced to El Serrano and why they keep coming back. 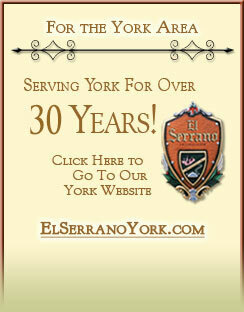 Tell us your story and why you enjoy dining at El Serrano. El Serrano reserves the right to use your submission in part or whole in any marketing or advertising media. No phone numbers or email addresses will be reproduced in any media format. Email and phone number is for El Serrano internal use only. 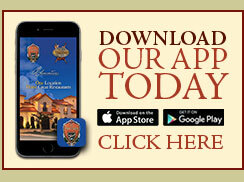 See How Much Others Have Enjoyed Dining At El Serrano! Below are actual testimonials from satisfied customers. The food is really tasty. I love Peruvian food and this is the best place to get it. Everybody should try the ceviche!!! The service is great, the atmosphere is rustic but elegant... I can't wait to go again. This is the best place to eat Spanish in PA! hands down! the whole vibe is Spain & Peru in one!! Beautiful, elegant, wonderful staff and the courtyard adds the hint of latin soul. Recently we visited our son and daughter-in-law who live in Lancaster. Our daughter-in-law suggested your restaurant. We loved the entire experience, the food was excellent!!! I just wish there was an El Serrano here in Ontario Canada. Thank You. We set out on Saturday evening to find a great place to have dinner. Upon arrival at El Serrano, we were graciously greeted by the valet and a helpful hostess staff. We arrived thinking that we were entering only one restaurant, but in fact it was three restaurants in one. We decided to have dinner at the second floor restaurant, Culturas and we are so glad we did. The atmosphere was quiet, romantic, and one of a kind for it's location. Our server was excellent. He was knowledgeable, easygoing, and accommodating. Our meal that evening arrived in shifts which was a fun and quite relaxing way to enjoy dinner. This gave us the chance to share in conversation and anticipate what the next course would be. The food was delicious, flavorful, and authentic, and we thoroughly enjoyed every bite. Thank you for sharing the experience! I am so happy that there is a great Spanish restaurant less than an hour away. I have been to Spanish restaurants in Puerto Rico, Chicago, Arizona and Spain and this place captures the true atmosphere of Andalusia, especially on a hot day. The food was outstanding, service was great. 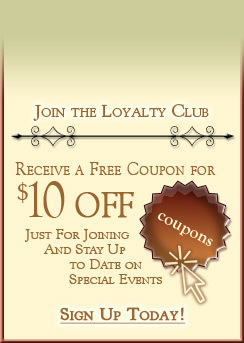 I look forward to more of the special events and entertainment. Flamenco dancers and Spanish guitarists perhaps!